In a previous article I mentioned how, in the early seventies, a group or artist had to sell a huge amount of albums or singles, to achieve a top twenty placing. This was a time when multi-million selling albums was common place. When the group this article is about, released their fourth album in 1971, it reached number two in the US Billboard 200 selling twenty-three million copies, being certified platinum twenty-three times over. Led Zeppelin and their album IV, stayed on the US charts longer than any other of their albums. Back in their home country the UK, the album reached number one in the UK album charts, spending sixty-two weeks in the charts. Since then, the album is considered one of the greatest albums ever to be released. Over the years, it’s received every awards and accolades possible, and is always found in the lists of the best albums ever released. This album was the perfect way to answer their critics after the mixed reviews their previous album III had received. Before I review the album, I’ll briefly tell you the background to this album. Led Zeppelin set about recording what would become IV in Island Record’s new recording studios in Basing Street. On the recommendation of Fleetwood Mac, they then moved to Headley Grange, an old Victorian house in Hampshire, where they used a mobile studio belonging to the Rolling Stones. After the tracks had been completed, they returned to Island Records’ studio for overdubbing, before heading to Sunset Studios, in Los Angeles, to mix the album. All this took place during 1970 and 1971. However, once they started mixing the album, they encountered some problems. The group weren’t happy with the mix, and they returned to London to redo some of the work they’d just finished in Los Angeles. This meant the album’s release date became delayed by several months, with the album not being released until 1971. Once they were happy with the album’s sound, came the job of promoting the album. Now the group had finished the album, they could set about promoting it. First they had to decide the album’s title. Instead of giving the album a title, it featured four hand drawn symbols, on both the inner sleeve and record label. Each symbol was meant to represent a band member. Nor would there be any information on the album cover, with the band’s name being downplayed. This was almost unheard of, and many people at Atlantic, their record company feared that this would damage sales of the album. Before the album was released, Atlantic sent copies of the graphics to the press, so they could include the symbols in articles about the album. Since the album’s release, it has been referred to as IV, although that wasn’t the original title. However, the lack of a conventional title didn’t harm the album, or sales. When the album was released, it was critically acclaimed. Critics realized that Led Zeppelin were back, having produced a brilliant new album, after a slightly disappointing previous album III. Fans loved the album too, and in the UK, the album reached number one, while in the US the album peaked at number two. Sales of the album were huge, selling twenty-three million copies, and 1.8 million copies in the UK. Since then, the album has consistently sold well, and it’s received numerous awards and accolades, and is always included in the lists of the greatest albums ever released. So Led Zeppelin’s album IV, was critically acclaimed, and a huge commercial success, but what does it sound like? IV opens with Black Dog which has a hesitant start, before the track bursts powerfully into life with Robert Plant’s lung bursting, unaccompanied vocal giving no indication of what’s to come. What follows is a masterclass in full on rock ‘n’ roll at its very best. Jimmy Page’s screaming, lightning fast, guitar playing, John Bonham’s frantic drumming driving the song along with John Paul Jones bass guitar. The tempo is fast, the sound hugely loud, as the song drives along, complete with occasional pauses, before the track builds back up, returning to the earlier frantic pace. You can’t help but admire Plant’s vocal, it’s one part raw power, to one part sheer passion, as he almost screams and bawls his way through the track. Black Dog inspired a new generation of bands, but none of them can play full on rock ‘n’ like Led Zeppelin. A brilliant way to open the album. How do you follow a brilliant track like Black Dog? It’s quite simple really, with one called Rock and Roll. It begins with Bonham playing a drum solo, that’s fast, full and power personified. After that, the group treat us to some old school rock ‘n’ roll. Plant’s gives his usual energetic and enthusiastic vocal, as the band turn back the years. Again, Page’s guitar playing is fantastic, it’s quick, accurate and sounds like something you’d expect Chuck Berry to play in years gone by. Behind him, Bonham punishes his drums, Jone’s bass sits at the bottom of the mix and later, Rolling Stone Ian Stewart plays a fantastic piano solo. A lengthy part of the track is just an instrumental where the group demonstrate just how good musicians they are. Together, the band produce a fantastic track that although relies on power, stays true to the spirit of rock ‘n’ roll. After two really rocky songs, Led Zeppelin change styles with The Battle of Evermore which features Sandy Denny on vocals. It has a distant, meandering start with Jimmy Page playing mandolin, before Plant sings the lead vocal, accompanied by Sandy Denny. This is a very different track, it’s slower, with a folk feel and sound, especially with the instruments used and the way the vocal is sung. By now, it’s mandolin and acoustic guitar that are playing. There are no electric instruments used on the track, but one thing hasn’t changed and that is Robert Plant’s vocal. Sometime’s he cut’s loose, and really sings loudly, using his powerful, energetic vocal, especially towards the end of the song. Mostly, though, he resists this temptation, and it’s a much more restrained vocal from him, more in keeping with Sandy Denny’s vocal style. Although, this is a good enough song, I much prefer the much more rocky side of Led Zeppelin. Probably the most famous song that Led Zeppelin ever recorded is next, Stairway To Heaven, an eight minute epic, masterpiece. It’s one of the band’s best known, and best loved tracks. An acoustic guitar is played slowly and gently, before a recorder plays. Robert Plant’s vocal likewise is much gentler, more restrained as the track meanders beautifully along, the lyrics among the best on the album. After just over two minutes, the song starts to fill out, the arrangement growing slowly. A bass plays, guitars too, as Plant gives one of his best vocal on IV. Things start to really take shape when John Bonham plays, his drumming much more restrained here, than on the opening tracks. Eventually, drums, guitar and bass let loose. Another excellent guitar solo from Page takes shape, Bonham’s drumming is much louder and faster and Robert Plant decides he’s had enough of the restrained vocal style, and gives another lung bursting vocal performance, just before the track ends. Overall, this was a career defining moment for Led Zeppelin, as it’s both a brilliant track, and one of the most famous and best loved songs ever recorded. Having recorded such a great track, the problem is how do you follow it? The problem is, after Stairway To Heaven, anything else will sound second best. However, Misty Mountain Hop is the track they chose to follow Stairway To Heaven. Keyboards, guitars and drums all play, before Robert Plant sings the vocal. They combine powerfully, driving the track along, with John Bonham’s drums at the front of the mix. Plant’s vocal is huge, loud, he shows no restraint as sometimes, he screams, hollers and roars his way through the lyrics. Behind him, the rest of the band similarly, forget about subtlety, and really let loose. Page’s guitar playing and Bonham’s drumming are key to the sound, really providing a powerful and dynamic backdrop for the vocal. Jimmy Page demonstrates just how great a guitar player he was, playing a brilliant solo during the track. Robert Plant’s vocal launched a thousand wannabe impersonators, many of whom went on to form bands and have successful careers. However, there was only one Robert Plant, and here, he and the band, produce another slice of brilliant, hard, driving rock music. Straight away, guitars and rhythm section combine to produce a loud, powerful and driven backdrop for Robert Plant’s vocal on Four Sticks. Although his vocal is forceful and loud, he’s somewhat struggling against the magnificent hard rocking arrangement. It’s loud, repetitive, full of power and energy, an example of what Led Zeppelin do best. John Bonham’s drumming is among his best on the album, it’s loud, fast, accurate and powerful. Meanwhile, Jimmy Page’s guitar playing chugs along, it’s dynamic and dramatic with riffs aplenty, while Robert Plant shrieks, screams and wails, as he really forces the vocal. By the end of the track, you can’t help but admire the sheer power displayed by the band during the track. What they produce is like a powerful and dramatic wall of sound, which Robert Plant copes admirably with, producing a dramatic and energetic vocal. It’s an acoustic guitar, then mandolin that plays when Going To California begins. Straight away, you realize that this is a very different type of song. Here it’s just acoustic instruments that accompany Robert Plant’s vocal. His vocal is much softer, gentler and is much more restrained. Here he doesn’t indulge in any theatricals, no howls, wails or hollers, just a thoughtful vocal, sung beautifully, against a backdrop of acoustic guitar and mandolin. This is a very different Led Zeppelin, one that I enjoyed much more than The Battle of Evermore, the other acoustic based track. 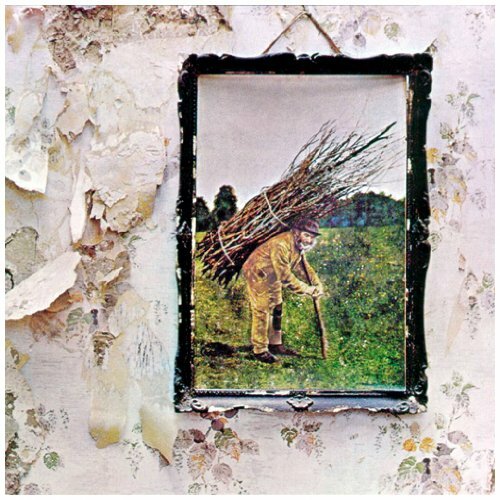 IV ends with When the Levee Breaks, which like Stairway To Heaven, is a much longer track, just over seven minutes in length. It begins with John Bonham’s slow booming drums, a bluesy harmonica solo plays, joining a screaming guitar, which solos brilliantly. It’s an arrangement that builds and builds, and as it does just gets better. After a dramatic pause, Robert Plant’s vocal enters, seemingly, much more restrained. This doesn’t last, he soon breaks free of his shackles, and is roaring, giving a powerful, energetic and passionate vocal for the last time on IV. It seems Led Zeppelin have kept one of the album’s best tracks for last. This is a track with everything. Great guitar solos, that screech, scream and howl, pounding, booming drums and a frenetic bluesy harmonica solo. Over seven minutes, the band really let loose, showcasing their talents as musicians, and demonstrating just why they were the greatest rock band of their era. When the Levee Breaks is the perfect track to end the album, it shows Led Zeppelin at their best, power personified, thanks to four hugely talented musicians, at the top of their game, with Robert Plant reserving a fantastic vocal for the album’s final track. Excellent. I’ve been a huge fan of Led Zeppelin for more years that I care to remember, and my favorite album has always been IV. This album saw the band recover from a somewhat disappointing response from critics to their previous album III. It also saw the eschew traditional marketing methods by not giving the album a “traditional” title. The album also came at a time when the band hadn’t toured for a while, so their profile wasn’t as high as it had been. IV was the perfect response from the band, not only was it critically acclaimed, but it was a huge commercial success, becoming their biggest selling album. When you listen to the album, you can hear why it was such a huge success. Here was a band at the top of their game, who had produced an album with eight great songs, played with power and passion, by four hugely talented musicians. Personally, by the time this album was released, I think the band were in their prime. They were by now seasoned musicians, with plenty of experience in the studio and as a live band. The scene was almost set for Led Zeppelin to produce a classic album. On IV’s release, it was obvious that they’d succeeded in doing so, and in the process, released one of the best albums ever recorded. It’s hard to believe that this year, in November 2011, IV will celebrate its fortieth birthday. It’s an album that’s aged well, and has that timeless quality that all good music has. If you’ve never heard the album before, it’s well worth buying, as you’ll hear Led Zeppelin in their prime, playing eight great songs, which make up their classic album IV. Standout Tracks: Black Dog, Rock and Roll. Stairway To Heaven and When the Levee Breaks. ← SYL JOHNSON-DIAMOND IN THE ROUGH.